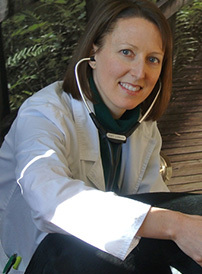 Veterinarians rely on most of their senses to perform a physical exam. Our hands palpate lymph nodes and abdominal organs. The sense of smell can detect unusual odors on the breath or body which may indicate systemic disease. Listening to the heart and lungs is amplified with a stethoscope. Although looking at all parts of a pet is perhaps the most important part of the examination, there are some regions of the body where visualization is difficult. A CT also provides information on whether or not there is any destruction of bone due to severe inflammation or masses. Indications for a nasal work-up include chronic nasal discharge (especially if blood is present), nasal congestion, sneezing, and snorting. 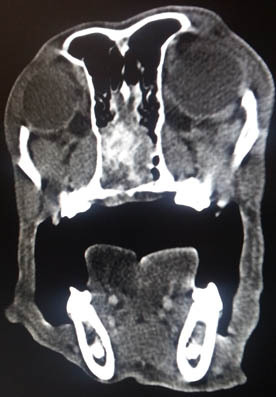 A CT scan is recommended first to determine where the disease is present. Rhinoscopy can then be performed to directly visualize the nasal passages. Biopsies allow for a definitive diagnosis of what disease process is present. Doctor Lomas practices at Southern New Hampshire Veterinary Referral Hospital where CT, MRI and advanced diagnostics are offered for pets. Please ask your family veterinarian if you feel your pet could benefit from a CT Scan.